At last, a silent fanless media server i5 PC, H270i, quad SSD options, HDD up to 8TB. Uses Akasa Euler M fanless case. Built to order. Usually ships within 3 days. Larger quantities available on request. 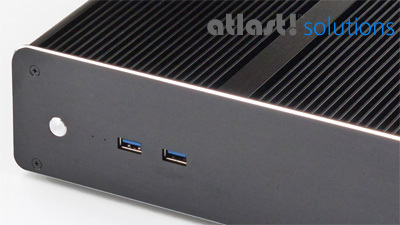 This fanless PC uses the Akasa Euler-M aluminium case. Features fast PCIe M.2 SSD with blistering speeds. The aluminium case has excellent cooling and the space for 4x 2.5" SSD (or HDD) storage. The storage can be accessed by removing the base plate, so you can change or add storage in future. The latest Kaby Lake Quad Core i5-7400T processor gives the performance of a high end large PC, yet it runs so cool that it can be fitted into this fanless PC, consuming very little electrical power. The PC is perfect for use as a fanless media server or as a media centre connected to a LCD TV set using HDMI. The PC uses less than 15W when idle in Windows 10, and between 20W-35W when active. This model features the ASUS Strix H270i motherboard, which uses premium components throughout. It features dual LAN, Dual band Wifi, Displayport and HDMI output, 6 rear USB 3.0 ports and 2 front USB 3.0 Ports. If you choose 2 or more identical SSD or hard disks, they can be configured as a RAID 0/1/5/10 for speed or security. VESA mounting screws are included, so the PC can be mounted onto the back of large LCD monitors/TVs that have VESA mounting holes. Rubber feet are supplied for use on a desktop. We can configure this unit with up to 32GB DDR4 Memory. In total 1 x M.2 SSD plus 4 x 2.5" Solid State Drive (SSD) or Hard Disk Drive (HDD) can be fitted, enabling various options for SSD, HDD and SSHD hybrid disks. Hardware RAID is also supported if you choose a pair of SSDs, and they can be configured in RAID0 (striping) or RAID1 (mirroring). See the performance information below. Please contact us if you want a custom configuration. We can also pre-install with Windows or other Operating Systems. If the 16GB option is chosen then 2x8GB modules are used. If the 32GB option is chosen then 2x16GB modules are used.